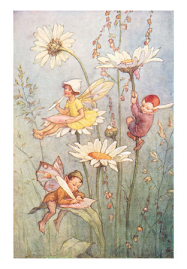 Five fabulous fairies flew through the crack into the garden one night when the air and was warm and still. “How nice to be in the garden,” said Chantal. She flew to the top of the trampoline and sat on top of the safety net. She looked like a pretty, pink rosebud there. “How nice to be outside and not cooped up in a house,” said Zaira. She zoomed down to the trampoline and bounced straight up again. It made her laugh, so she did it again and again. “The garden smells different after a hot day, don't you think?” asked Amber. She flew into the camellia bush and sat swinging on one of the leaves. “Let's go see,” said Zaira. The five fairies towards the house, staying carefully in the shadows. “Let's fly up to that window sill,” said Britney. "The will not see us there." The five fairies flew to a dark window and sat on the sill. “But how can stars be tied to a house?” asked Daisy. “Let's go see,” Zaira cried, and darted towards the colorful, little stars. “Do you think we could touch them?" Five fairies followed the string of stars that decorated the house verandah. “It is certainly tricksy," Daisy told her. "It is best to be careful and not touch them ourselves." 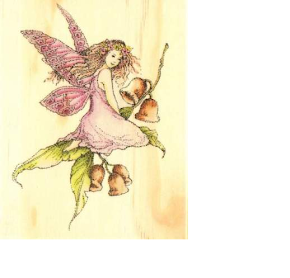 Five fairies flew back into the garden and hovered where they could look at the lovely, shining lights. “But aren't they pretty,” said Chantal.